The double cream aside, this Chicken Curry recipe is surprisingly healthy - low fat chicken, tomatoes, onions, lime juice, garlic and other herbs are all good for you. 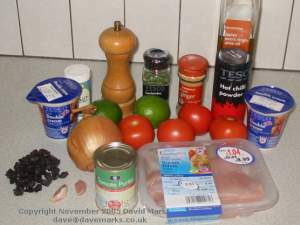 This recipe has two other great things to recommend it, it's very easy to prepare without a huge list of ingredients and it's very tasty. We used a mix of long grain and wild rice because it's so tasty. By all means use basmati rice if you prefer. (salt and pepper definitely not used)! NOTE: The amount of chilli powder will depend on how hot you prefer your curry. 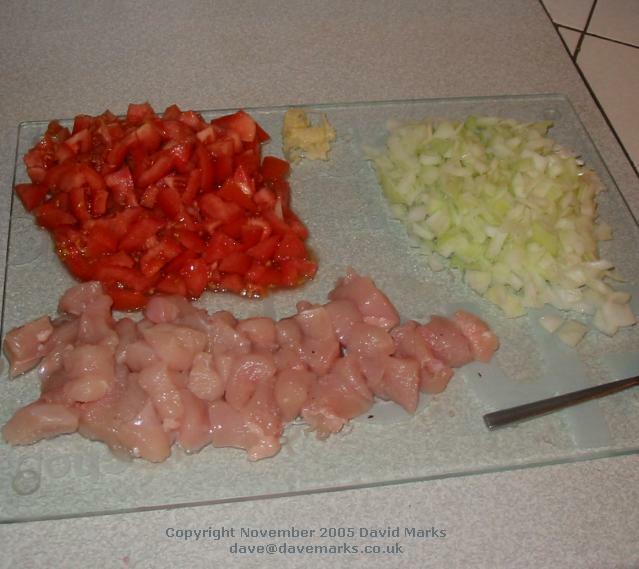 The amount in the recipe will give a medium curry, add more or less as you prefer. We use dried coriander here and there is a reason for this. When the chicken is added to the spices in the pan the dried coriander sticks to the chicken much better than fresh coriander. This gives the chicken a much better coriander flavour. Peel and crush the garlic cloves. On a medium heat, add the oil to the frying pan and add the chilli powder, ginger and coriander. Fry for two minutes. 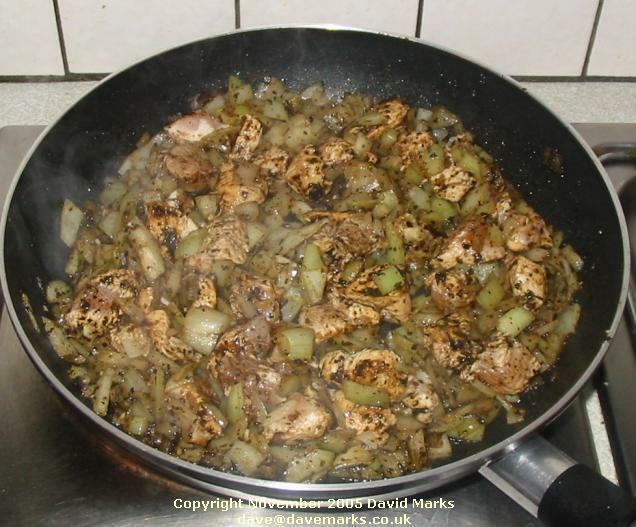 Add the chicken, onion and garlic to the pan and fry until the chicken turns golden brown - this will take around five minutes. Add the tomatoes and tomato purée to the frying pan and let the mixture simmer (barely bubbling) for five minutes. Depending on how long your rice takes to cook, now is a good time to start it off. 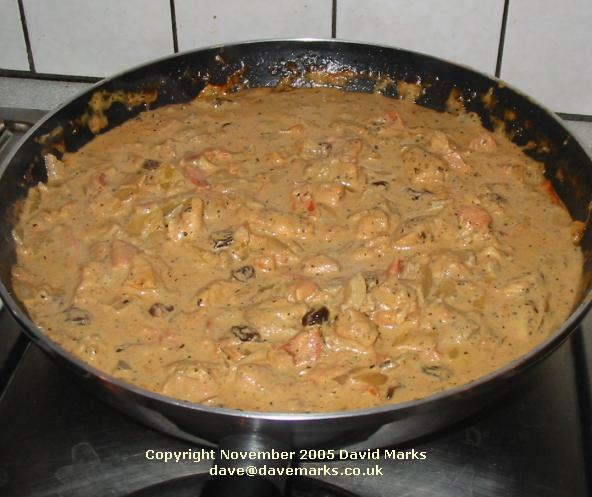 Add the cream, lime juice and sultanas to the curry mixture and let it all simmer for 18 minutes. Stir frequently. 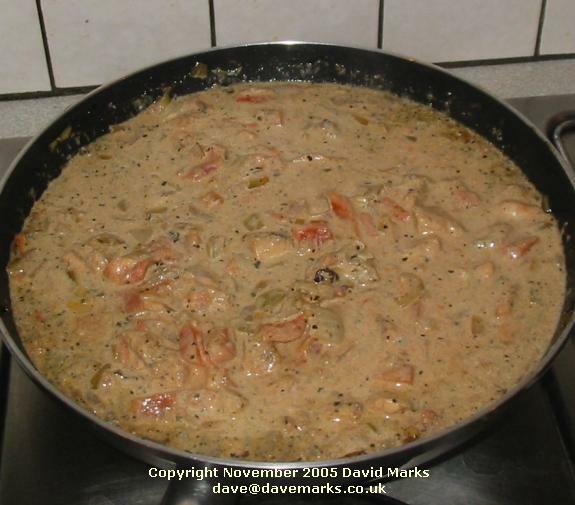 The mixture will thicken up during this time to produce a rich curry sauce. 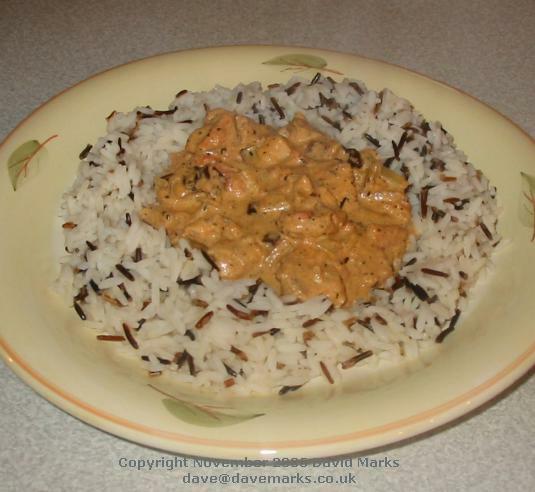 When the rice is cooked, drain it and serve on a plate with the curry on top. We used a ready made mixture of American long grain rice and wild rice which is both attractive and tasty.